This is my composting toilet. I use it, throw the paper in it, and cover with sawdust. When it is full, I dump in under a big pine tree and rake pine needles over it. Next, I rinse out the bucket with my saved gray water and throw the water on the pile. There isn’t any smell. You don’t have to use sawdust. You can use what ever you have: bark, duff, whatever. For material to cover it outside, the idea is to have something fluffy that allows a lot of air to get to it so it can heat up, kill any bad stuff, and compost fast. In the book, he recommends straw. I use pine needles because that’s what I have, but you could use leaves, weeds, or what ever. My bucket is called a Luggable Loo. It’s a five gallon bucket with a toilet seat lid. In the book he builds a nicer looking system. 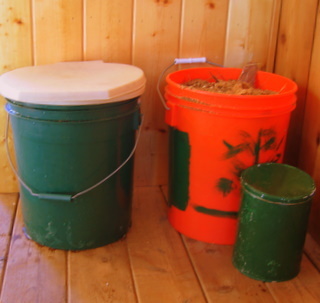 You could just use a 5 gallon bucket with a regular lid. Hmm… I have a hard time believing that this sytem doesn’t smell. Pingback: As The Crow Flies» Blog Archive » Living without running water. Previous Previous post: Chilling walk.